On 8th February, representatives from LDUK and other Lyme disease groups and organisations attended a meeting in Westminster, arranged by Teresa Pearce MP and her consitituent Deb Collins. MPs and members of the House of Lords were able to meet with doctors, researchers and patients with the aim of forming an All Parliamentary Party Group (APPG) which was achieved in March. Thanks go to Simon Hoare MP and Michelle Donelan MP for co-chairing this group. LDUK received a Top Lyme Disease Blog award from Feedspot. LDUK launched its first big awareness campaign, ‘Wake Up to Lyme’ which was a huge success! Awareness packs containing leaflets, posters and other educational materials were distributed across the nation and put up in pharmacies, GP surgeries, supermarkets, post offices, vet clinics, libraries and schools. The campaign was a big hit across social media as well with our campaign Facebook posts being viewed over 220,000 times. LDUK representatives attended the AONM’s conference entitled Chronic Disease Uncovered – Lyme Disease, Viral Pathogens, Morgellons, Mould and More. Our awareness campaign materials were also distributed at the conference. A Scottish Lyme disease rally was held on 24th May to raise awareness of Lyme disease in Scotland as part of the global awareness campaign and protests, supported by LDUK. LDUK awareness materials were displayed and distributed. Alexander Burnett MSP sponsored and invited LDUK to hold an awareness event in Scottish Parliament following his motion ‘Lyme disease: a need to do more’ which was debated on the same day as the event. 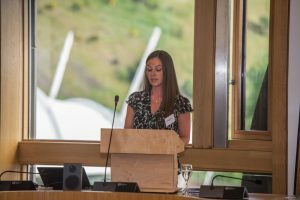 The drop-in awareness event was attended by approximately 100 people which included many Scottish MSPs, members of the Lyme Disease UK team, doctors with experience of treating Lyme, representatives from outdoor and recreational organisations as well as patients and carers. LDUK members took part in fundraising events around the country including book launches and a football team Fun Day – the Maidstone Kestrels U11 team proudly wear our logo as they continue to raise awareness and support our organisation! LDUK was approached by the ‘Unrest’ film team and we worked collaboratively with the Impact team to promote the film in the UK. Our representatives were invited to attend the Preview screening in London. LDUK hosted an event with American author and speaker Katina Makris who was visiting London and who gave a very informative and inspiring talk. LDUK launched our Expert Q&A series on our website and we have had the honour of interviewing leading experts from around the world who have been generously donating their time to answer questions from our support group members. LDUK provided stakeholder comments for the government Independent Reviews on Lyme disease as well as the NICE draft Lyme disease guideline. LDUK representatives attended the AONM conference ‘Waking to a New Dawn: The Emergence of 21st Century Acquired Immune Deficiencies & Innovative Solutions’ and distributed awareness raising literature.